Does It Make Sense For Newmont To Increase Its Gold Output In An Unfavorable Environment For Gold? Newmont Mining (NYSE:NEM) in its latest long term outlook increased their production forecast for 2018 by .2 million ounces of gold. With the latest update on interest rate hikes announced this week, three more rate hikes are almost certain in 2018, which would reduce the potential of enhanced revenue for gold mining companies in the upcoming year. However, we expect that Newmont would not be able to take complete advantage of its increased output given the bearish forecast for gold prices in the upcoming year coupled with its increase in expected cost. Gold is largely considered a safe haven asset from an investment point of view, with macroeconomic or geopolitical uncertainty driving the investment demand for the yellow metal. Demand for gold as an investment is inversely related to the U.S. interest rate. Rising interest rates would most likely drive investors towards other asset classes such as fixed income investments as they become more attractive. Below is our projection for gold prices over our forecast period. 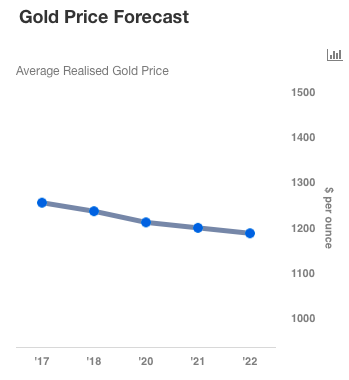 You can view our base case for the gold price forecast here and create different scenarios using our interactive platform. Despite the pessimistic outlook on gold, the metal might see a spike in its price in case of any sudden geopolitical outbreak like the recent uncertainty regarding North Korea’s nuclear agenda. In such a scenario, Newmont would be able to significantly benefit from its increased production volume. Apart from that, we expect Newmont’s earnings to be stagnant in 2018 even with the increase in its production volume. We have a $36 price estimate for Newmont, which is currently in line with the market price.